It was in the year 1840 when the Sutton-in-Ashfield and District Sunday School Union was given its existence, and during the past 67 years it has accomplished a good work. It has now 33 Nonconformist Sunday Schools within its fold, with an aggregate number of 780 teachers, and 7,544 scholars, besides 2,023 band of hope members. Its early secretaries were Mr. George Allsop, of Alfreton Road; the late Mr. W. Bonser, of Albert Square; and the late Rev. T. B. Adin, of High Pavement. The last-named was succeeded by Mr. F. W. Buck, J.P., who held the post 32 years, reliuguishing the office in 1906. On December 19th of that year, in the Reform Street Primitive Methodist School, Mr. W. T. Pickard (the then President of the Union) presented him with a framed illuminated address in recognition of his long services on behalf of the Union. Mr. R. Naylor, of Priestsic Road, was appointed Mr. Buck's successor at Whitsuntide, 1906. Mr. J. Pickard, C.C., of Cursham Street, has had a long and faithful connection with the Union, having held the position of treasurer for the past 37 years. Before occupying that office he was a vice-president, and succeeded the late and respected Mr. Richard Needham, ironmonger, at his death on February 10th, 1870, in his present post. Mr. Pickard had not missed attending an annual meeting of the Union for the past 66 years, and was prevented from being present at the last one at Whitsuntide, 1907, owing to having met with an accident on November 6th, 1906. The Rev. J. Stephenson is president this year. Like chaff from a threshing floor." This little, narrow thoroughfare, having communication with High Pavement and Parliament Street, was for many, many years known as "Blind Lane." in consequence of a blind resident there called "Blind Tom.'' Here is a true story: "Once upon a time 'Mr. Jones' was in the habit of returning home after his leisurely spent evenings in not always (so it was presumed) altogether a self-possessed state of mind, so an acquaintance of his—'Mr. Smith'—made a resolve to have some rare fun at his expense. Taking up his position in the lane one night about the time the belated one usually passed through, and having clad himself in a white robe so that not a particle of his human self was visible, he moved slowly along. Then 'Mr. Jones' arrived on the scene, and overtaking the white-robed form walked by its side apparently unconscious of its presence. Feeling somewhat disappointed at his non-success, 'the ghost' proceeded to make his presence more keenly felt by jostling against the 'stop-out-late' individual, who, thereupon, to the sudden astonishment of 'Mr. Ghost," remarked, 'Oh. if thou'rt a jostling ghost, here's at the'!' and, suiting the action to the word, he promptly levelled an effective blow with his favourite walking-stick on the cranium of ' Mr. Ghost,' who hastily fled away! That was the first and last time he appeared in the role of ' A Ghost'!" MILL STREET. It is presumed that this street received its name from the fact of a wooden windmill having formerly been located in the vicinity. It belonged to a Mr. J. Lindley, a well-known miller and baker, carrying on business in the antiquated premises now to be seen in High Pavement. On the occasion of the attempt to transfer the mill to another site it suddenly overturned, doing irreparable damage. The existing mill at the bottom of Prospect Place was then erected, subsequently passing into the hands of a Mr. Heath, on to the late Mr. G. B. White, then to Mr. J. G. Allsop, High Street, and in now owned in its disused state by Dr. Nesbitt, J.P.
Take your mind back over 60 years or so, and instead of the humble cottage where Mr. Charles Scott (an octogenarian) now dwells in Parliament Street, you will observe a public-house, bearing the sign, "King William the Fourth" Inn. At this inn there dwelt a Mr. S. Bower, the owner, who also conducted the business of a "bag hosier." This will at once convey to you the information how the yard round the corner came to wear its name-plate. It is believed that owing to unguarded circumstances the inn licence lapsed, and afterwards the property was purchased by the late Mr. W. Sampson, the present owner being Miss Sampson, of Loughborough. A Mr. S. Hudson also once lived at the house, and retailed stationery goods and followed the occupation of a hand framework-knitter. His family is now in America (Mass.) in the woollen goods business, a son (who is now a doctor) having recently married a daughter of the late Mr. Leeds Caunt, of Market Street, Sutton. Mr. and Mrs. Scott have lived in the house since 1869. This small yard, which is attached to the residence of Mr. C. B. Beecroft, grocer, auctioneer, etc., in Church Street, owes its name to the Rev. Clement Nott, the Particular Baptist Chapel minister. who resided here in 1837. "THE WELCOME" INSTITUTE AND CAFE. This attractive and useful building in Brook Street (adjacent to the Market Place), owes its origin, in a huge degree, to Mr. W. Read, of Cursham Street, Sutton, whose portrait is seen in front of the building printed below. Mr. Read, who came from Oldham (Lancashire) to Sutton in December, 1899, became the Secretary of the now defunct Band of Hope and Adult Temperance Union, and in 1901, seeing the need of such an institution for the parish, he wisely acquainted Mr, A. B. Markham, M.P., of Stuffynwood Hall, of the fact and the Member for the Mansfield Division interesting himself in the movement, gave a handsome donation of £1,500 towards the building. The Duke of Portland followed with handsome gifts of the site covering an area of 500 yards and a sum of £100, whilst Mr. Emerson Bainbridge very liberally gave £1,000 and the piano in the hall which now bears his name. The Rev. J. Stephenson (Congregational pastor), later took up the secretarial duties in connection with the building scheme, and still holds that position—a position which ho worthily occupies — whilst Mr. F. W. Buck, J.P., was Chairman of the Committee of about 50 gentlemen representing the various public bodies in the town. The total cost of the structure was about £4,000, it being opened December 8th, 1906. by the Duke of Portland, supported by Mr. A. B. Markham, M.P., and Mr. Emerson Bainbridge, his Grace receiving a silver key at the hands of the architect (Mr. Percy B. Houfton, of Chesterfield) in commemoration of the event. The trust deed provides that the building shall be non-political and non-sectarian, and that it shall be managed by a Committee, consisting of representatives of the various public bodies in the town, who shall, if necessary, create other Committees which may be needful for carrying on the work of the Institute. The building is of sand-faced bricks, with stone-dressed doorways and gables, etc. Internally, in the basement are commodious kitchen, stoves, heating chamber, etc. The ground floor has shop, cafe, billiard-room, committee-room, and reading-room. On the first floor is a large hall seating 1100 people, a fitted stage, retiring rooms, and a smaller room which may be used as a girls' club room. The second floor comprises two committee-rooms and a caretaker's house. It is luxuriously furnished throughout. 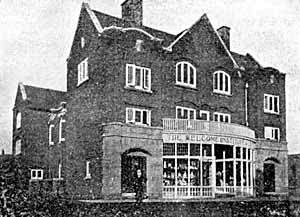 This is the most handsome building in Sutton, it being opened April 4th, 1906, by Mrs. Alliott. of The Park, Nottingham, the foundation stone; being laid by Mr. James B. Alliott, of Nottingham, in May, 1905. Messrs. G. Baines and Son, of London, were the architects, and Mr. J. Greenwood, of Mansfield, the builder. 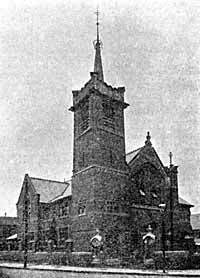 The Church occupies a prominent position at the junction of High Pavement and Victoria Street, the large and commodious Sunday Schools erected in 1892 being on the south side of the new building. The Church, which dates back to 1651, possesses a good record of faithful work and progress. It is the mother church of the county, and has recently established a Mission Church in one of the most needy districts of the town (Chatsworth Street). The new structure is of late Gothic design, freely treated, and faced externally with red-pressed bricks, with white dressings and tracery windows, etc. At the corner of the site there is a bold, square tower, terminating in an octagonal spirelet and weather vane which lends dignity to the edifice, the height to the top of the vnne being 80 feet. Two front entrances, one in tower and one in opposite wing, give access to the gallieries by means of fireproof staircases, and a separate staircase in the rear leads up to the choir and organ chamber in apse behind the pulpit. A large vestry for the minister and another for the deacons are provided, also heating and fuel store. The ground floor seating is circular, every hearer thus directly facing the minister. The accommodation on the ground floor is 414, in choir 40. in galleries 288 (total 742 adults), or a mixed congregation of over 850 persons. Memorial windows have been erected in the sanctuary to the late Mr. and Mrs. C. Plumbe, Mrs. Littlewood, Mr. W. Sansom, and Mr. A. E. Littlebury. The seating is of pitch-pine, whilst the pulpit and communion rails are of English oak. A mallet and trowel (the former made out of oak got from the old Church in King Street) were presented to Mr. Alliottat the foundation-stone laying, and a solid silver key to Mrs. Alliott at the opening. On November 13th, 1906, a new organ was opened at a cost of £400, £200 of which was given by Mr. A. Carnegie, the American millionaire. The total cost of the new building (including additions and alterations to school) was £5638. A sum of £2,000 was received from the Sutton Urban District Council for the sale of the old chapel in King Street, which was acquired for market extension purposes, and £38 5s. for purchase of land in High Pavement. On Saturday, March 23rd, 1907, the grounds of the church were planted with a beautiful variety of trees, including laburnum, scarlet hawthorn, limes, black Italian poplars, laurels, holly, etc., with a great variety of evergreens and privet for hedge in New Street. The Rev. J. Stephenson is the present pastor, previous pastors being the Revs. —. Kirkpatrick, C. Wilson, — Pringle, —. Jackson, —. Baker, W. H. Meir and J. Q. Christian. Number of Sunday School scholars 620. Writing in his "History of Sutton," published in 1838, of this Church, Dr. S. T. Hall remarks:—"Situated in King Street, erected by voluntary contributions in 1743, and enlarged in 1815. The congregation worshipping in this place was in existence in 1651, the Rev. Mr. Tuke, an aged and blind Clergyman, ejected from the Parish Church in 1662, for Nonconformity, was of the same persuasion. About the era of the Revolution they held their meetings in the house of Mr. Lockyer. They afterwards assembled in a small meeting house at the top of Little Lane (Market Street), which belonged to Mr. Allwood, who officiated as their Minister for 40 years with a salary of £16 per annum. To him succeeded Mr. Wilson, by whose exertions the King Street Chapel was first erected. In 1804 they commenced a Sunday School on a large and liberal plan, which has continued to the present time. Being removed from the place in which it was taught, they erected in 1836. with the assistance of their neighbours, the large school room situated in the Back Lane, in which two hundred and forty scholars receive Scriptural instructions on a Sabbath Day. and about 100 on the week days. The Rev. T. Roome is the present Minister." This place of worship was built, or founded, approximately, in 1811, but previous to that date services were conducted in Sutton by friends who came over from Kirkby Woodhouse. The existing building in Parliament Street was enlarged in 1862, and the adjoining piece of land has been purchased for further extensions in the future. The structure does not lay claim to any special grandeur of architecture. It is purely a meeting-house of prayer, puritanical, yet homely. Former ministers: The late Revs.—. Barker, E. Johnson, and —. Baker, and S. W. Twiggs. The Rev. W. J. Packer, after a ministry of six years, left July 31st, 1907. The number of Sunday School scholars taught here is 350. This Chapel, with a burying-ground attached, situate in Parliament Street, was built in 1771-2, and opened by the Father of the late celebrated Robert Hall. This Society was founded in Sutton by the late Venerable Abraham Booth, and first met in "Bower's Hall" in a room used by Heard and Hurst, hosiers, as a taking-in warehouse. It has had several distinguished pious men for ministers, amongst whom we may mention the Father of the self-instructed philosopher—Joseph Whitehead, whose memoirs were published by the late Mr. Roome. The Rev. Clement Nott was the minister in 1838. In the Spring of 1832, a branch Chapel was built at Eastfield Side, to which now belongs aSabbath School with upwards of 160 children. It was used for many years by the Wood Street Baptist as a schoolroom, and then it was renovated by Mr. T. C. Barrett, and occupied by him until he built Providence Hall. High Pavement. Since then it has been in the occupation of the Salvation Army, who have a Sunday School with 118 children's names on the books. It may be noted as rather remarkable that this Chapel, which was the "Mother Chapel" of the Eastfield Side Baptist, gradually lost the whole of its members, and the Branch Chapel has now become the Central Chapel for that particular sect. The burying-ground attached to the Parliament Street Chapel was closed many years ago, but several stones erected to the memory of the departed whose bones are reposing in the tiny sacred prescincts may still be seen. The writings are now almost indiscernible, some of the stones having beentheie since 1773. It may be here mentioned that the Eastheld Side Chapel has purchased a plot of land near to the Mansfield Road Council Infants' School for the erection of a new place of worship, their present one being in Barn Street. Plans have been prepared by Mr. F. P. Cook, of Mansfield Woodhouse, and building operations, it is expected, will he commenced shortly. The Reform Street Chapel, which was erected 1840. was the first place of worship used by the Sutton Primitive Methodists. The first meeting-house was in a dwelling at the top of Bedlam Court (now Lord Street), off Parliament Street in 1837. When first erected, the Reform Street Chapel was used for school purposes as well, but in 1876 a schoolroom was built to the rear of the Chapel. In 1894 the schoolroom was rebuilt on a larger and more convenient scale, which consists of a school hall and 10 classrooms. In 1902 the Chapel was enlarged so as to accommodate 250 worshippers. During the whole history of the Chapel, Mr. John Pickard, C.C., of Cursham Street, has been intimately connected with the place, having tilled every oflice, and a framed life-sized portrait of that venerable gentleman was presented to the School in 1904, in recognition of his 50 years' service as Superintendent. Branch Chapels were also erected at Porter's Buildings, Forestside (Mansfield Road), and New Cross, so that to-day in Sutton Primitive Methodism is represented by upwards of 200 members, 100 teachers, and 1000 scholars. The Mansfield Road Primitive Methodist Chapel was built 1866. Porter's Buildings was opened 1856. New Cross was opened 1895. THE METHODIST FREE CHURCH, which is in the Ripley Circuit, was erected in 1903. It is situate in Priestsic Road, the structure being of corrugated iron, and measures about 826 square yards. Number of scholars on books about 206.